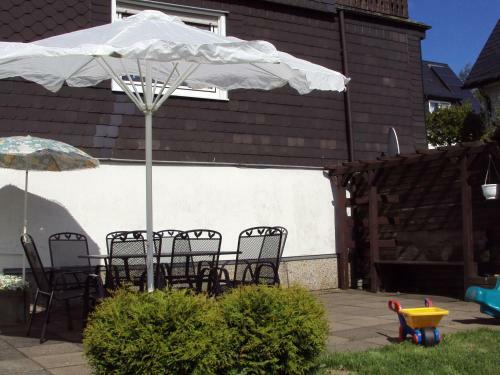 Located 1.7 miles from Kahler Asten in Winterberg, Holiday home Zur Kahler Asten 1 offers accommodations with a kitchen. The property is 2.3 miles from Bobbahn Winterberg. The vacation home includes a living room and a bathroom with a shower. A TV and a DVD player are available. Bikepark Winterberg is 2.2 miles from Zur Kahler Asten. The nearest airport is Paderborn-Lippstadt Airport, 41 miles from the accommodation. When would you like to stay at Holiday home Zur Kahler Asten 1? Offering a well equipped kitchen, a patio, 2 bathrooms and a four separate bedrooms. This detached holiday home is in the heart of the well known winter sports village of Altastenberg. It is suitable for ten people. The home is just 200 metres from the ski-runs and lifts. There is a living room with seating and dining areas and a well equipped kitchen. There are four bedrooms, one of which has a 2 x 2 metre king size bed, and two bathrooms. It is the perfect house for a long weekend with the family or two families travelling together. The garden is 900 m2 and the terrace has garden furniture. They are both perfect for enjoying the sun. The house is in a very convenient position. The town of Winterberg with its shops, restaurants and pavement cafes is just three kilometres away. You'll find beautiful, scenic walking routes and a wooded, hilly landscape just a stone's throw from the house. Please note: The house can be booked for a maximum of eight adults and two children. House Rules Holiday home Zur Kahler Asten 1 takes special requests – add in the next step! Holiday home Zur Kahler Asten 1 accepts these cards and reserves the right to temporarily hold an amount prior to arrival. We need at least 5 reviews before we can calculate a review score. If you book and review your stay, you can help Holiday home Zur Kahler Asten 1 meet this goal.